Frankly, we're as surprised as you about this, but a solid project candidate revealed itself within one week of searching. What we believed would be a 6-month to one-year search turned out to be virtually instantaneous. Why did we feel the search would take so long? 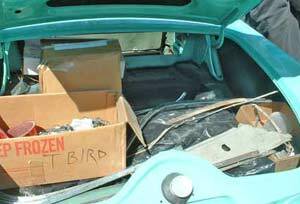 Well, for starters, there aren't many unrestored '55 T-Birds out there to begin with. Of the 16,000 — or so — built, most of those still in existence were restored long before now. Some of those restorations are 25-30 years old, but their prices are overinflated. It makes no sense to spend $20,000 up front on a restoration project that will only be worth $35,000 in the end. 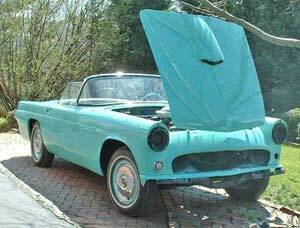 Here's how bad things are: For around $10,000 you can find a [mostly together] Bird that has the usual rust in the floor pans, trunk, fenders, frame, etc. The engine probably doesn't run and the whole thing is a greasy mess. 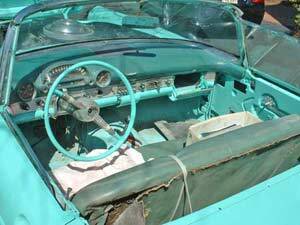 We've recently seen cars for sale that have obviously been pulled from a salvage yard - they have no engine, transmission or TITLE, not to mention the utter lack of trim and things like steering columns! The price of these is still in the $6,000 range, believe it or not. Why not a '56 or '57 to enlarge the available playing field, you ask? Well, either of those is nice, but we happen to think the exhaust exits on the '55 are about as slick a design as anyone's ever come up with. The '56's bulbous continental extension isn't that appealing to us, and we positively dislike the horizontal exhaust exits at the outside tips of the bumpers. That goes for the '57 as well. Also, we don't care for the lengthened body of the '57, nor the too-large grille in the front. We saw a couple good candidates but weren't fast enough to grab them. They were priced in the $12,000 range and looked (on the internet, at least) to be solid and complete. They sold within a day, sight unseen. WHEW! The car we bought cropped up on an obscure internet sight. At first we were a little concerned about it because of its location: Queens, NY. This is not a typical place to find intact newer cars, much less one that's 50 years old, so our guard was up. Several emails passed back and forth, with the owners answering them frankly and honestly (in our opinion.) This communication was followed by a few phone calls, wherein we asked very pointed questions. The owners, a retired couple, explained during the phone calls that the T-Bird was purchased 10 years ago for restoration. They removed the body from the frame — found no serious rust on the frame — and had all rusted metal cut out of the body. New metal was welded in and the body was finished off and painted Thunderbird Blue and looks very straight. It was reinstalled on the frame with new body mounts. 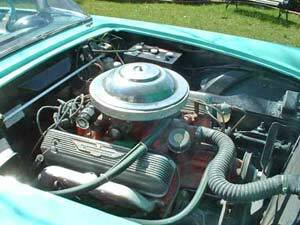 The 292 V8 engine ran when they bought the car, but it was a replacement engine from the 1960s. The Fordomatic transmission is the original. 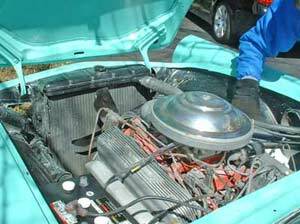 The car has no soft top assembly but does have a hard top with portholes (not original to '55, but a retrofit so popular in the 50s that the J.C. Whitney catalog offered kits!) The chrome is in very good condition and all trim is there. Everything in this situation "felt" good, so we dispatched Les Jackson's radio co-host, Fred Staab, to look the car over carefully. Fred lives on Long Island and was only about a half hour away from the car, so he agreed to check it out (by the way, he's built a number of drag cars and knows his way around bodies and frames.) His visit verified all claims made by the owners and the decision to make an offer was made while he was on the premises. The deal was struck ($12,500) and we started making arrangements to get the car down to the Second Chance Garage. We called upon Gary LoPinto at Sarizer Motor Company in New Jersey. Gary delivers test cars for the manufacturers and moves the occasional concept car to and from auto shows. He knows how to do it right and was willing to take on the transfer for a fair price, so we entrusted the T-Bird to his care. The car arrived as promised and we began the process of evaluating everything from stem to stern.